Letters to WTF: is tube linearity just a matter of lower gain and higher operating voltage? Or it is inherited with the medium – vacuum vs semiconductor? Generalizations are difficult to make, but you can look at the theoretical mechanisms of operation for some interesting nuggets. In a tube, current is transferred between anode and cathode by the space charge in a vacuum. Child’s Law states that current in a vacuum is directly proportional to anode voltage (to three halves power) and inversely proportional to the distance between electrodes (squared). The speed of electrons depends solely on the applied voltage. In semiconductors constructed of doped sandwiches of semiconductor material, Child’s Law doesn’t apply. Here we use the Mott-Gurney law. This states that the current density in a semiconductor is directly proportional to anode voltage (squared) and inversely proportional to the thickness of said material (cubed). The speed of the electrons depends on both the electron mobility of the semiconductor (assumed to be constant) and the applied voltage. There are extra constants for calculations in either case, but notice the similarities. In both cases, we can assume distance between electrodes (whether separated by a semiconductor or a vacuum) doesn’t change. The difference here is the power for the voltage term. The generalization is that current density through a vacuum is less affected by changes in anode voltage than is current through a semiconductor. Is this the theoretical mechanism to explain the heuristic that vacuum tubes are more linear than transistors? Maybe…at the very least it’s an interesting observation. In reality, geometry, application, and other factors matter, aside from just materials. Some tubes are more linear than others just as some transistors are more linear than others. There are bad ways to bias and operate tubes just as there are good ways to bias and operate transistors. Letters to WTF: why can’t tubes run on 12V like transistors? This is a good question and a topic that rears its head pretty regularly in DIY. If we don’t have to work with 300V, we’d all prefer not to; however, there’s a reason that we brave high voltage in our quest for tube audio. There are a few tubes that will operate reasonably well at low anode voltages —see PDF article here or space-charge tubes like 6GM8– but the majority of tubes are going to want 50V+ on the anode to reach respectable linearity. There is some discussion of this in the write up for the El Estudiante headphone amp. Recall also that tubes pass current in mA so producing usable power (V * I) is going to require lots of voltage (typically hundreds of volts). That high voltage and low current pass through the output transformer to become the low voltage and high current that’s suitable for driving 8 ohm speaker loads. A lot of it comes down to fundamental construction. Tubes have a vacuum gap across which current must flow, so a decent amount of voltage is needed to create enough potential difference to get electrons moving reliably from cathode to plate. Maximum potential current is limited by the anode voltage according to Child’s Law (three halves power of the anode voltage divided by the squared distance between electrodes). Transistors are a silicon sandwich and capable of much higher current, but they are voltage limited by the breakdown rating of the semiconductor region material/thickness. Hybrids are a really cool topic, IMO. SS has an advantage in directly driving low impedance loads with high current, while tubes have advantages in small signal voltage amplification (no NFB, high Zin, simple, low noise). So, can tubes run at low voltage? Some of them do ok for musical instrument applications (eg guitar effects), but usually we want more potential (voltage) to overcome the vacuum gap and get the lazy little electrons moving in order to reduce distortion and achieve good tube-to-tube repeatability. What’s the deal with hybrid amps? All books on audio design that stoop to cover the archaic and backwards idea of vacuum tube amplification begrudgingly admit tubes are wonderful open-loop voltage amplification devices. They’re very linear (much more so than transistors without feedback), tolerant of high voltage, and forgiving of approximated parts values. Tubes do not make great current gain devices though. Therein lies the problem for us glow bulb fanatics. To make power, we need both voltage and current. We usually side-step the current-handling weakness of tubes by developing large voltage signals with multiple stages and then using an output transformer to turn the big voltage at modest current into modest voltage at big current. We know that the voltage gain of a grounded cathode with a bypassed cathode resistor is the Mu multiplied by the plate load divided by the sum of the plate load and the plate resistance. Accordingly, the amp above develops voltage gain of about 18x in the first stage, 16x in the second stage, and 3.2x in the final stage. This is an overall voltage gain of about 900x, meaning a 1V signal at the input becomes a 900V signal at the output. In reality, the 300B runs into grid or current cutoff before it gets anywhere near that much voltage swing at its plate and a more likely figure is about half this or 450V peak to peak. This 450V peak to peak is still quite a lot of voltage. If you could directly drive an 8 ohm load with it [narrator: you can’t] you’d produce thousands of watts. To produce the thousands of watts, you’d use dozens of amps. You have about 0.06 amps [sad trombone]. We use an output transformer to step down the voltage and step up the current. We know that the voltage ratio of an output transformer is the square root of the impedance ratio. In the case of a 3.5k to 8 ohm transformer, that is the square root of 3,500/8 or about 21. Divide 450V by 21 and we get the voltage swing that the 8 ohm speaker is seeing. It’s about 22V peak to peak (seven and a half watts). We created a hell of a lot of voltage just to step it down to a measly 22V peak to peak. This is where hybrids might come in. Solid state is quite happy driving amps of current into an 8 ohm load and only need a supply voltage of a couple dozen volts. They do away with the multiple voltage gain stages and output transformer. If you can create 22V of signal with a single tube stage, a transistor doesn’t need to make it any bigger; it just needs to provide enough current to drive a low impedance load like a speaker or headphone. Let the tube do what it does best (voltage gain) and let the transistor do what it does best (source lots of current). So why don’t we see more hybrid designs? For one thing, the power supplies get complicated. You often want a bipolar (plus and minus) supply for the solid state section, a low voltage heater supply, and a high voltage supply for the tube’s plate. Although you rid yourself of an output transformer, you probably added a power transformer (and rectification, filter, etc). Another reason we don’t see more hybrid designs is that many designs which do exist don’t use the devices to their strengths and so cast doubt on the concept. 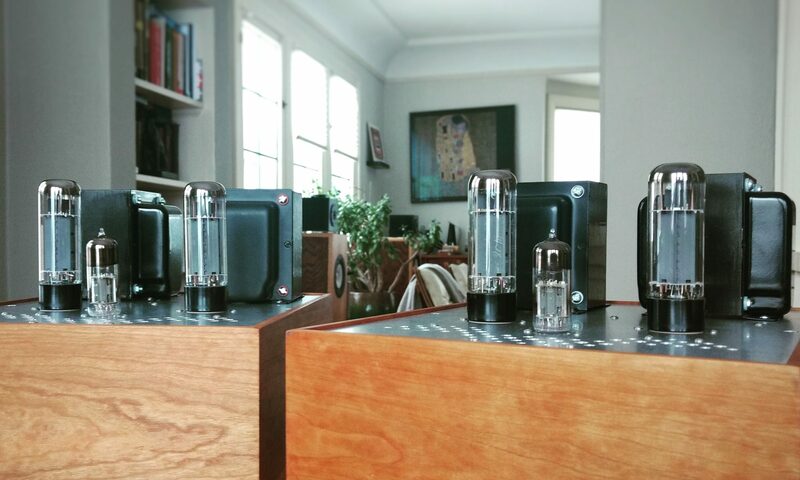 When you see a single tube in an integrated amp, it’s often there as a simple cathode follower. I’ve got nothing against cathode followers, but that implementation is about as much a hybrid design as a burger with lettuce and tomato is a salad. But by far the most likely reason we don’t see more hybrids (in my opinion) is that devotees of the objective/subjective, transistor/tube, modern/traditional design school are too human. If modern politics hasn’t sufficiently convinced you, the state of the audio market should. We’re kind of a bunch of tribal-minded, technocentric, get-off-my-lawn jerks. If you build a hybrid, you piss off both sides. So yeah. Screw that. This was the long way of saying I’m building a hybrid amp.